September is Life Insurance Awareness month, but we’re going to pause for a moment. Did you know the Atlantic Hurricane season is from June 1, 2012 to November 30, 2012 this year? Six months of potential hurricanes? Summer is over and the threat of hurricanes has subsided in New England. People think about fall, leaves, apples, and impending Nor’ Easters this time of year. Check out our infographic below. What do you think? 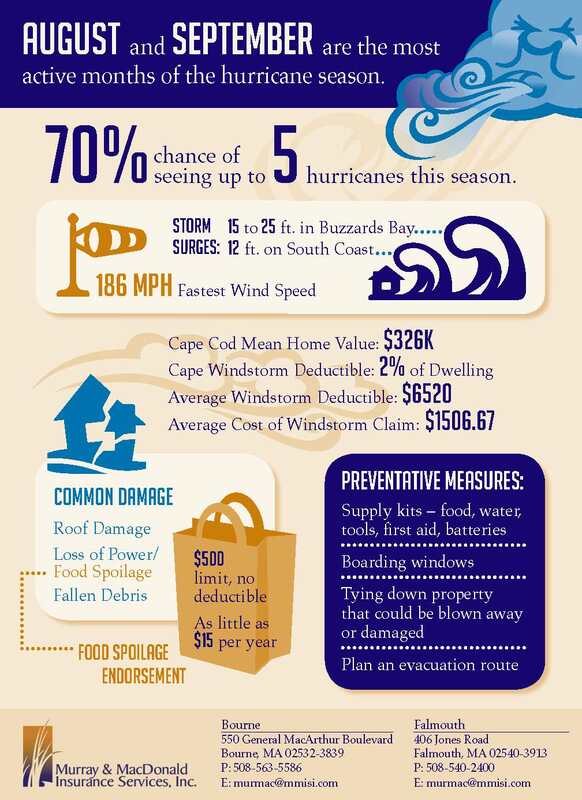 Have you weathered a hurricane? Do you have any stories? The hurricane that caused the most damage in New England, that I recall, was Hurricane Bob. I remember driving around Falmouth at the age of 7 and seeing the damage first hand- houses blown over or washed away, boats washed up onto the road, trees down everywhere, no power for at least 3 days (and that was good, some people were out for 7+ days). Our family was lucky and only experienced two trees falling down in our yard (near our swing-set, oh the sadness for us kids if the swing-set was hit), people we knew had trees fall on their homes, businesses, cars, etc. Murray & MacDonald Insurance had a high number of claims being reported every minute. We didn’t have power for first FOUR days. Can you imagine no power for that long? We had one phone line working. Our strategy was: take a phone call call, get the critical information, take their phone number, tell them you’ll call back. Pull their paper file. Call back from a cell phone. We had to keep the main line open for clients to call. (Remember, this was before call waiting). All claims were hand written. Critical claims were sent to the company immediately. That means if the fence in your backyard fell down, the claim process will take a little longer than someone who can’t live in their house, don’t have a house, have a huge whole in your roof/floor/wall. Today, it’s different. We function off the internet. What happens when we lose the internet? If Cape Cod faces a major storm, Murray & MacDonald is prepared. Do we have a generator, no? We have some better, it’s called Agility Recovery Solutions. If our agency suffers damage, loses power, can’t access the internet, we bring in the disaster solution. Come back tomorrow to see what I’m talking about.